Green Bay wins its second straight Super Bowl title. Bart Starr again was chosen the game's most valuable player. The game marked the last for Vince Lombardi as Packers coach, ending nine years at Green Bay in which he won six Western Conference titles, five NFL championships and two Super Bowls. The game became the first to draw in a $3-million gate in football history. 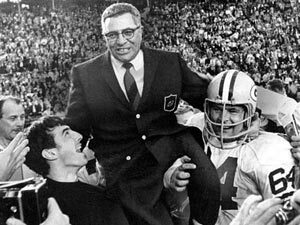 Green Bay Packers coach Vince Lombardi is carried off the field after his team defeated the Oakland Raiders 33 to 14 in the Super Bowl II.